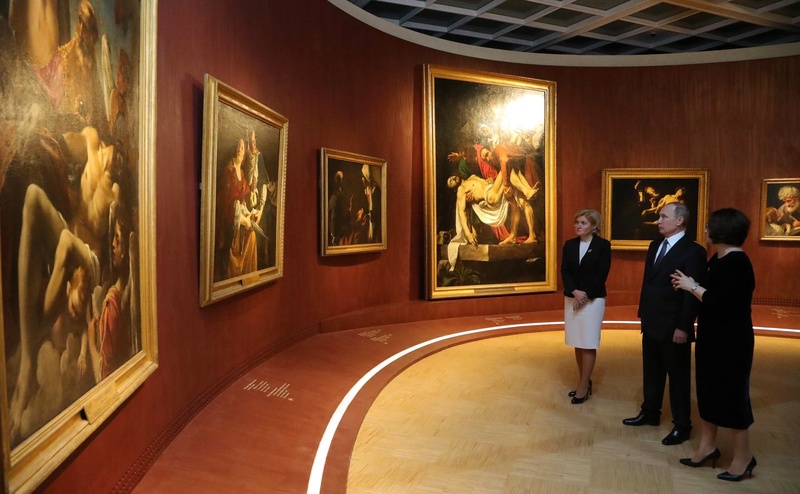 Russian President Vladimir Putin visited Moscow’s famous Tretyakov Arts Gallery on Feb. 8 night where he had a tour of two exhibitions underway there - "Roma. Aeterna. The Masterpieces of the Vatican’s Pinacoteca" and "The Masterpieces of Byzantine". He began the tour of the Vatican display with a rare 12th century work of the Roman school, "The Redeemer Conferring a Blessing" that had never left the walls of the Holy See previously. The next work he stopped by was "The St Francis of Assisi" painted by Margaritone d’Arezzo in the 13th century. Tretyakov Gallery workers said the painting is featured in all textbooks on the history of arts and it represents the earliest known portrait of the saint who played a crucial role in the rise the Western Church. Putin was also shown the works of masters of the Gothic style, whose paintings are extremely rare in Russian museum collections. The exhibition "Roma. Aeterna. The Masterpieces of the Vatican’s Pinacoteca. Bellini, Rafael, Caravaggio" represents a unique project as the Vatican Museums are showing the best part of their collection of 12th to the 18th centuries in Russia for the first time ever. The forty-two canvasses by Giovanni Bellini, Melozzo da Forli, Perugino, Rafael, Caravaggio, Guido Reni, Guercino, Nicolas Poussin come across as real treats to the visitors. A preliminary agreement on preparing the exhibition was reached in the course of President Vladimir Putin’s meeting with Pope Francis I in Vatican City in June 2015. The President also had a tour of the "Masterpieces of Byzantine" display.